The baseball definition for a “Cup of Coffee” is a short time spent by a minor leaguer at the major league level. One way a player can get a cup of coffee is via the September call-up when teams are allowed to expand their rosters from 25 players to 40. Many players joining teams during September make just an appearance or two, and never return to the big leagues. 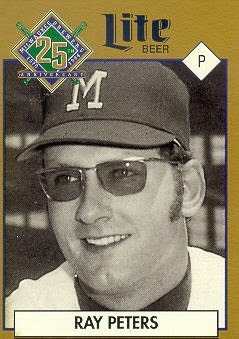 In 1970, the first year of Milwaukee Brewers baseball, there were two such cup of coffee player appearances. Both are notable because they came prior to the September call-ups. Pitcher Ray Peters made just two starts and saw his major league career last about a week. Raymond James Peters was born in Buffalo, New York, on August 27, 1946. In his playing days he was listed as 6’5” and 225 pounds. But the 6’5″ was how tall Peters was as freshman in high school, and he says that somehow that number just stuck. He’s actually somewhere between 6’6 1/2″ and 6’6 3/4″. Peters had four pitches he relied upon – a fastball, big curve, changeup, and breaking slider. He said his curve and fastball were generally his strongest pitches. Peters went to Nichols School in his native Buffalo and the big right-hander quickly made a name for himself on the mound. He decided to attend Harvard University and stuck with it until graduation, even as teams tried to draft him. Peters was determined to get his degree from Harvard and in each case the money offered wasn’t enough to sway his decision. The Detroit Tigers were the first team to draft Peters as they chose him in the 28th round of the 1965 MLB June Amateur Draft. Next the Kansas City Athletics picked him in the 5th round of the 1967 MLB June Draft – Secondary Phase. After the Athletics moved to Oakland they again selected Peters, this time in the 2nd round of the 1968 MLB January Draft – Secondary Phase. The New York Mets also drafted Peters while he was in college. They picked him in the 3rd round of the 1968 MLB June Draft – Secondary Phase. 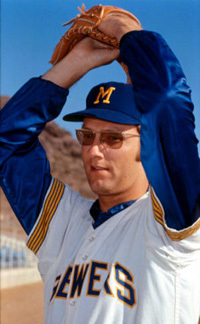 Peters finally decided to sign with the Seattle Pilots after they chose him in the first round of the 1969 MLB January Draft – Secondary Phase. He finished with a college record of 17-5 and kept his earned run average under 2.00 in both his sophomore and junior seasons. Peters also hit well in college with a .286 in his first season and .273 the next. He was named to the Sporting News All-American Team in 1968. Peters graduated with honors in History from Harvard before reporting to the Pilots minor leagues in June 1969. He had a great 1969 season covering three levels, finishing with a combined 12-4 record and a 2.98 ERA. It looked like Peters had a real opportunity to move up to the expansion Pilots and help the team. 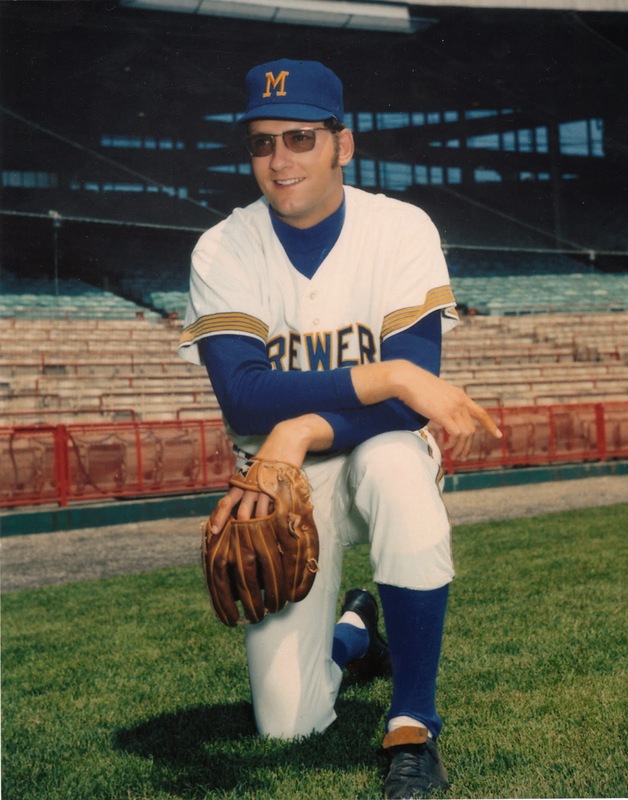 When the team was bought in bankruptcy court and moved to Milwaukee in 1970, Peters stuck with the club but did not make the roster out of spring training. He was sent to the minors until being called up on June 1. While Peters’s won-loss record and E.R.A were not particularly note-worthy — – at Portland, he had recently recorded two shut-out wins in the very hitter friendly AAA Pacific Coast League for the Beavers. The Brewers had been scuffling in the standings and had suffered a rash of injuries to their pitching staff. The team was also about to kick off a four game series with the Cleveland Indians which included a doubleheader on June 2. An extra arm was needed immediately. Peters made his debut against the Indians on June 4 in an 8-4 loss at Milwaukee County Stadium. Just 8,625 fans were on hand to see Peters pitch two innings while giving up six hits, four earned runs, and three walks. He did record a strikeout against Ray Fosse. In all, 15 batters came to the plate against #41. Peters said he had two favorite hitters at the time – righty Al Kaline (future Hall of Famer) and lefty Vada Pinson. In his short career, Peters was fortunate enough to face both Kaline and Pinson. He managed to get Pinson to fly out in the Indians game. On June 9, Peters made his second and final start and got to face Kaline and the Detroit Tigers. Peters was removed from the game in the first inning without recording an out. He was taken out with the bases loaded after giving up a single and two walks – including a walk to Kaline. Kaline turned out to be the final batter Peters would face in his major league career. Peters was relieved by Skip Lockwood. The next hitter struck out before Lockwood gave up a grand slam to Willie Horton. In two games his final line was two innings with seven hits and five walks. He was charged with seven earned runs for a 31.50 ERA with a 0-2 record. No one hit Peters hard in the two games. He only gave up singles and four of those were broken bat bloopers. The timing of that second poor start for Peters couldn’t have come at a worse time. Outfielder Steve Hovley was traded to the Athletics and in return the Crew received infielder Tito Francona and pitcher Al Downing. To make room for the extra player the Brewers sent Peters back to Portland. He would never return to the big leagues. Peters spent the bulk of 1970 pitching for the AAA Portland Beavers. Many Brewers pitchers have admitted that it was a tough stadium to pitch in, and the team wasn’t very good overall. Peters started 24 games for Portland and had one relief appearance, posting a 5.78 earned run average over 134 innings with 109 strikeouts. His record was 7-10 that season. Peters started the 1970 season with Jacksonville of the AA Southern League with better results – a 0.45 ERA over 20 innings pitched, highlighted by an opening day shut-out win. Peters was dropped back to AAA ball in 1971, but only made one appearance for the Brewers team in Evansville in the American Association before being traded with slugging catcher/first baseman Pete Koegel to Philadelphia. The Brew Crew netted Johnny Briggs in what is still considered one of the more lopsided trades in team history. Briggs smacked 80 homers and drove in 259 with a .258 batting average across five seasons. He also had some versatility, playing all three outfield spots, first base, and designated hitter. By the time Briggs was traded to the Minnesota Twins in 1975, he was the Brewers all-time home run leader. On the other side, Koegel would appear in just 53 games for the Phillies in 1971-72, and hit just .173 in that time frame. The Phillies assigned Peters to their AAA Eugene team in the Pacific Coast League for the remainder of the 1971 season where he logged 100 innings, but pitched to a 2-9 record with a 5.67 ERA. He hung up his spikes after that and has cited injuries as a reason to leave the game. There isn’t any Topps baseball card of Peters, but a card was included in the Brewers 1994 25th anniversary card set. Peters did have a photo taken on one knee by noted sports photographer J. D. McCarthy (see photo below this article) at County Stadium after he was called up to pitch for the Brewers. It was the head shot portion of this photo that was used for the anniversary card in 1994. You’ll also see a Topps photo of Peters below this article (in follow-through pose) from spring training 1971 with the major league club. Twin Buttes in Tempe, AZ is in the background of Brewers Field at Diablo Stadium. The Harvard Hall of Fame inducted Peters in 1993. In 2010 he was diagnosed with autoimmune autonomic ganglionopathy (AAG)—a rare disorder characterized by failure of the autonomic nervous system. He was successfully treated for the disease with a combination of steroids and a drug that suppresses the antibodies. Today he lives in Texas with his wife Janis. They were married in 1970 on an off day while Peters was with Portland. In 2015 an article was posted on the Baseball Hall of Fame website about Peters and his wife visiting Cooperstown for the first time. Peters was wowed by the museum and looked great wearing a Seattle Pilots polo shirt. You’ll find many more articles on Ray Peters beyond the aforementioned HOF story. Go to Google and search to learn more! A huge tip of my Brewers cap to Ray Peters for being extremely helpful with career information, edits, and images. Cheers to you, Ray! Funny thing — I just posted a bio about Mr. Peters on my baseball card blog (linked here). He is a very genial, genuine man!